The wedding invitations may not be the very first entry on your bridal to-do list, but they are one of the most important things to get right. Your wedding invitations set the tone for your special day, and give your family and friends the first hint of the celebrations to come. If you’re looking for personalised wedding stationery with flair, Très Inviting can help with everything from save the date cards, to invitations and place cards. You can choose a template, which you can then customise (at no extra cost) with your choice of colour, font, and font size. Or, if you have a specific idea in mind, Très Inviting can work with you on a fully customised design. Before you select your wedding invitations, it’s important to have a clear idea of the style and theme of your wedding, and the sort of atmosphere you want to create. Your invitations should then mirror that vibe. Although the team at Très Inviting leans towards contemporary design with clean and simple lines, they love a challenge and can produce unique invitations in a variety of mediums, including wood. If you have a special request, just ask. You may be surprised with what they come up with! Have you chosen a colour theme for your wedding? Your colours can be incorporated into your wedding invitations and other wedding stationery for a polished, cohesive look. By purchasing your invitations from professional designers like Très Inviting, you’ll have a much wider range of colours and fonts to choose from, but remember some curly fonts, especially in metallic colours, can be difficult to read on coloured backgrounds. The basic rule is to avoid light ink on light backgrounds, and dark ink on dark backgrounds. Of course, your invitation specialists will be able to advise you on colour, font and readability. 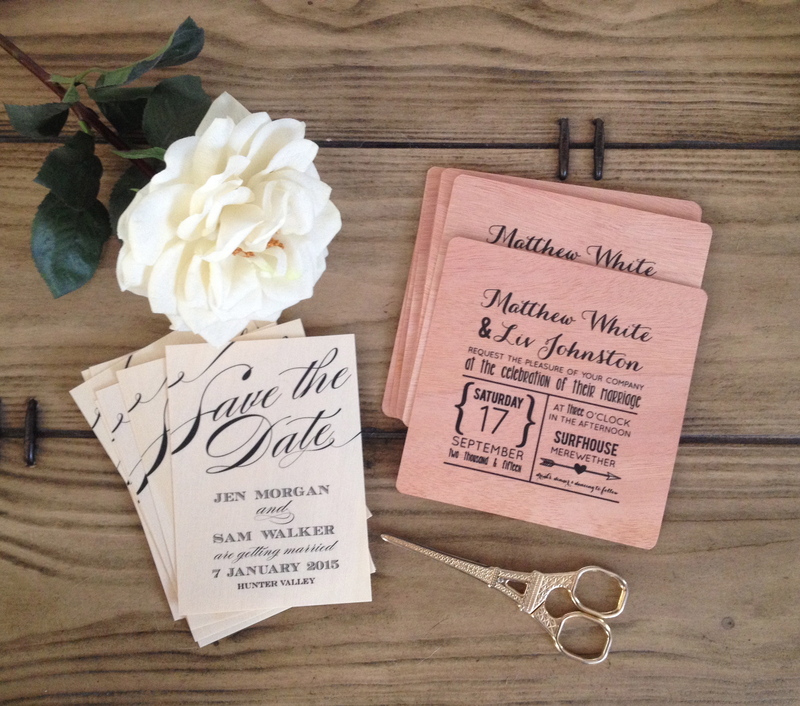 Traditionally, wedding invitations are 4.5 inches by 6.25 inches, but modern brides are happily swapping potentially lacklustre traditional invitations for a more playful approach. Whether your ideal invitation is a different shape, or has a 3D appearance, professional designers have the experience to help transfer your dream to paper and print. However, keep in mind the postage costs may be more for bulky or extra large invitations. Traditionally, weddings were hosted by the bride’s parents, but this isn’t always the case with modern weddings, so it’s important to be clear on the invitation who is hosting the wedding. While you can put a modern spin on how you word your invitations, it’s a smart idea to take a look at traditional wording and think about possibly blending both. Although the experts at Très Inviting will send you a total of three proofs to ensure your invitations are word perfect, don’t rely on checking them yourself. It’s very easy to overlook a mistake or a misspelled word when you already know what the invitation should say. Get a friend to check the final proof. If there’s not a grammar-savvy person to be found, steal a tip from copy editors and read the proof from right to left. It sounds weird, but you’re less likely to skim over an incorrectly spelled word that way. The invitation wizards at Très Inviting don’t stop at providing personality-filled wedding invitations, they also have loads more essential wedding stationery, including order of service booklets, place cards, menus and wedding thank you cards. They can even help with the appropriate wording for each design, with a variety of pre-worded templates. All this and an extremely fast turnaround; you can expect to receive your order no more than two weeks after you have approved the final proof. Was that a sigh of relief we heard?